Objective: Lift properly to minimize risk of injuries. Review the information on lifting, lifting hazards, and safe lifting. Describe jobs that might result in overexertion. Ask a worker to demonstrate appropriate lifting techniques. Cover some practical tips to avoid overexertion. Approximately 25 percent of workplace injuries result from lifting, pulling, or pushing objects. The part of the body most often injured is the back. Arrange your package delivery and material handling systems so that heavy loads are lifted and carried near the waist, between knee height and shoulder height. When possible, set heavy objects on pallets, benches, or other supports near waist height—not on the ground. 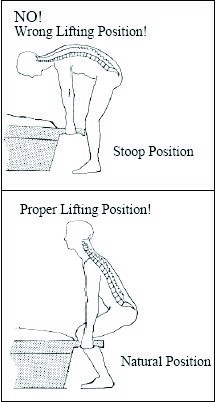 It is impossible to achieve a good back position when lifting heavy objects from the ground. Have a handling plan that avoids slippery hazards and includes a destination. Test the load to be sure that it can be safely carried. Know the limits! If the load is too heavy, awkward, or bulky to carry alone, get help. Use machinery or equipment, such as a pushcart, hand truck, wheelbarrow, forklift, or hoist. Do not overlook the use of levers, inclined planes, or rollers to move loads. Bending from the waist to pick up objects. Lifting boxes above the chest. Twisting the body to carry or lift a heavy box or object. Lifting objects when in poor physical condition. Use a proper lifting position. Lift with your knees and legs, not with your back. Avoid twisting. If turning is required while lifting or carrying a load, move the feet to turn the body instead of twisting at the waist. Approximately 25 percent of work-related injuries result from overexertion, mainly from lifting. Think and plan before lifting. Push rather than pull the load. Use mechanical means whenever possible. Avoid twisting when lifting or setting down a load. Move the feet to turn the body instead of twisting at the waist.